Photos donated by Bruce Conway. It is a 5 tube TRF with two stage RF, 200 soft detector, and two stages of AF. It covers the LW and MW bands. It is a tabletop unit and not a console as listed in the guides. It has an unusual configuration of viewing ports for the tubes, and individual rheostats for each tube. Power required is 6V-A ,and 45 to 90 V-B depending on the size of the loudspeaker. I have received very satisfactory performance using a Magmavox horn at 45 V plate. 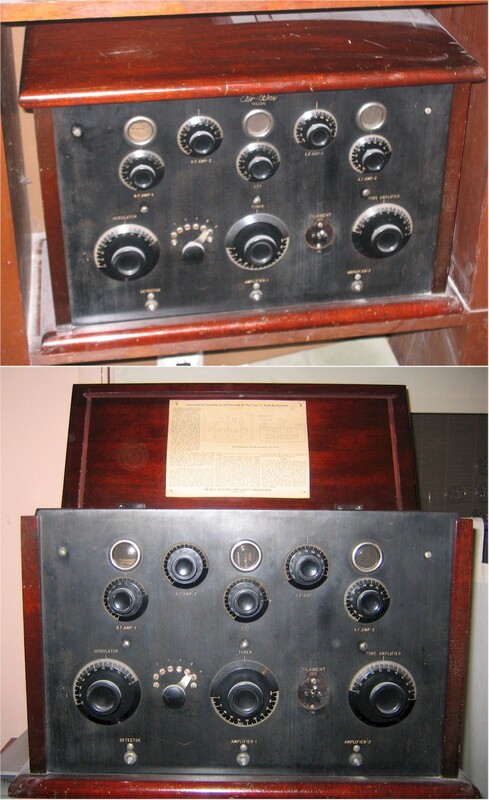 The over all look of this radio is classic for the early 20's with a transition from laboratory to home use.